Contest #563 – Where On Google Earth? Kasolo Island, or Kennedy Island or Plum Pudding Island, Soloman Islands. Brief haven for Kennedy and crew in WW2 after their PT boat was rammed by a Japanese destroyer. Kennedy (Kasolo) Island, Ghizo, in the Solomon Islands. Kennedy (Kasolo) Island, Solomon Islands. Kennedy Island (colloquially known as Plum Pudding Island, though the local name is Kasolo Island) is a small uninhabited island in the Solomon Islands that was named after John F. Kennedy, following an incident involving Kennedy during his World War II naval career. Kennedy Island lies 15 minutes by boat from Gizo, the provincial capital of the Solomon Islands’ Western Province … reads Wikipedia + -8.112448° 156.906321° somewhere in the Pacific Ocean ! 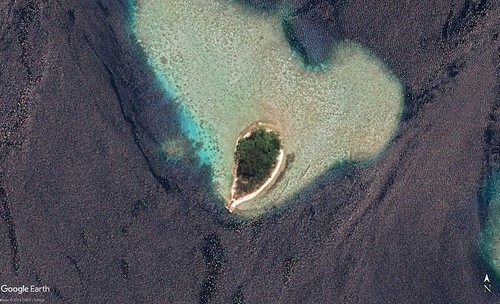 Kennedy Island in the Solomons.